en Spa Sleep Therapy bath soak combines evening primrose, jasmine and borage extracts with a dreamy blend of lavender, bergamot, patchouli and geranium pure essential oils. With organic lavender & essential oils of bergamot, patchouli & geranium. 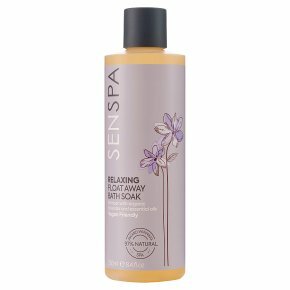 97% natural - natural body therapy.Sen Spa Sleep Therapy bath soak combines evening primrose, jasmine and borage extracts with a dreamy blend of lavender, bergamot, patchouli & geranium pure essential oils. Lie back in the bath, take deep breaths and free your mind of any stresses and strains. Your skin will be left feeling satin soft and delicately scented and your mind will feel relaxed and ready for restful sleep! Warning: For external use only. Avoid contact with eyes. Should this occur rinse immediately with warm water.<br>Due to the high concentration of natural oils and botanicals, product may vary over time and from batch to batch, this does not affect the quality or safety of the product.